Through service, WHSAD students gained a greater understanding of community. 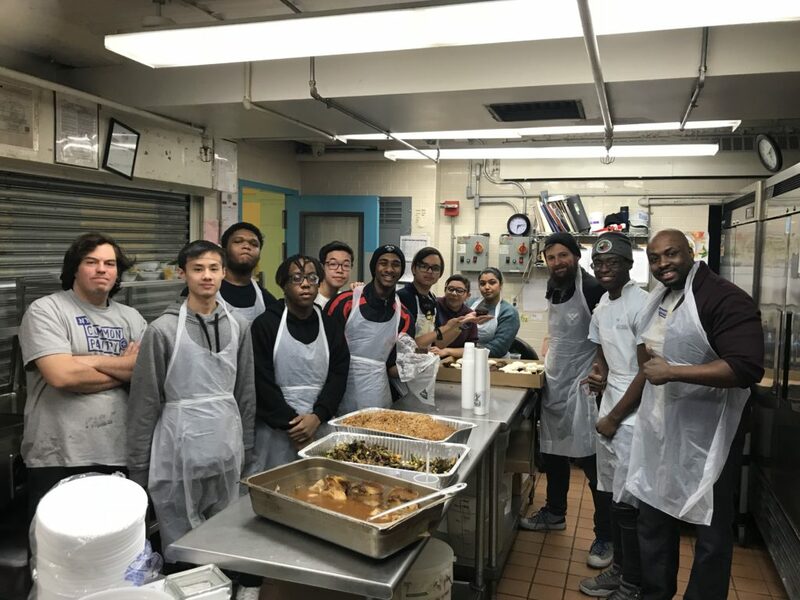 Mr. Michael Farfan (far left), assistant cook at New York Common Pantry, helped make both WHSAD students and staff feel welcome. 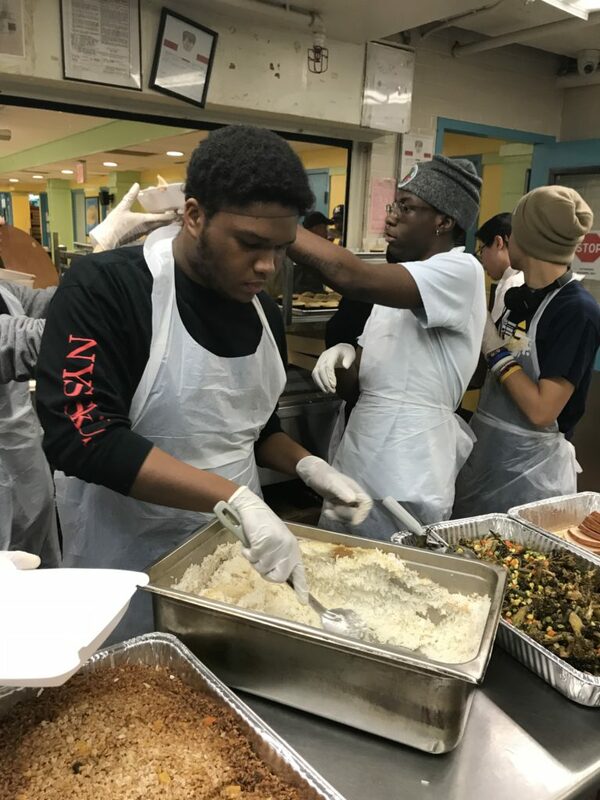 This past Friday, January 25th, WHSAD students traveled to New York Common Pantry and helped provide dinner for those in need. Thank you to all the employees of New York Common Pantry for their on-going and selfless work in brightening the lives of less fortunate New Yorkers. Thank you to all those at New York Common Pantry, including Mr. Michael Farfan, assistant cook, Ms. Ivy Saltos, receptionist and volunteer assistant, Ms. Stacy Gonzalez, volunteer associate, and Ms. Debby Lowenstein, volunteer manager. The following are narratives from three student participants. 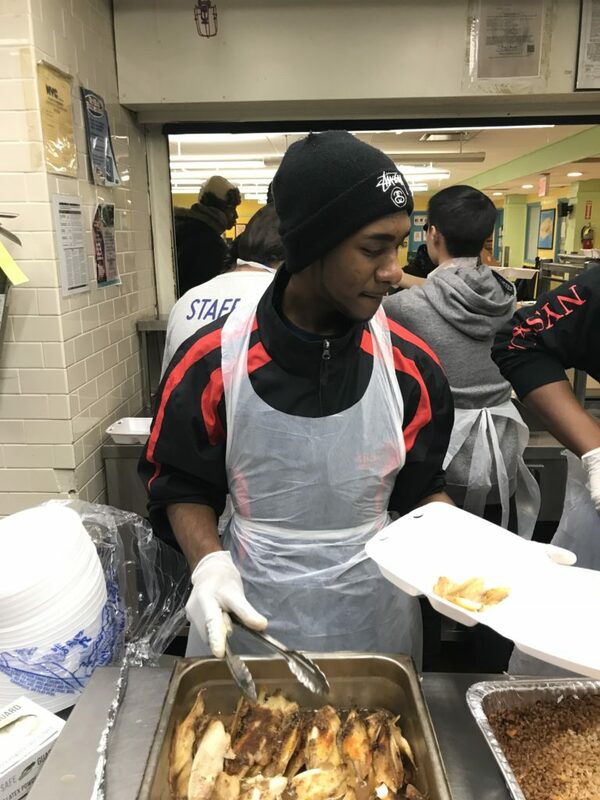 As I participated in the soup kitchen, I felt humble and realized how fortunate I am to always have a hot meal waiting on me when I get home or have the resources to eat whenever I want and not guess when my next meal would be. Interacting with the less fortunate was actually quite interesting in that they are just regular people and even though they might not have a lot, they still manage to keep a smile on. They made us feel comfortable by interacting with us like they knew each one, helping out as though it were not the first time they were meeting us which made it easier to work. We made jokes and briefly talked about sports among other things and were pleasantly greeted by everyone. 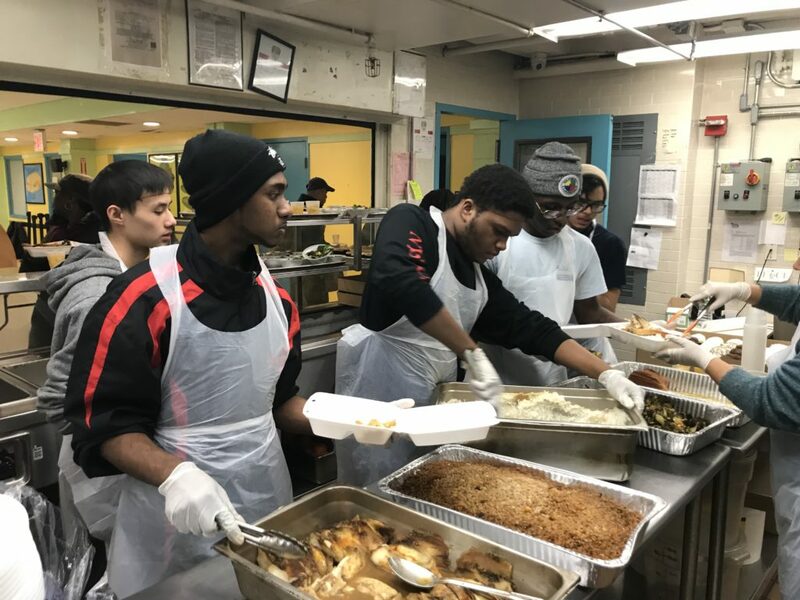 Students work together in order to dish out hot meals efficiently. You had to wear hair nets, which I had never done, so that’s a another new experience. I was tasked with refilling the cupcake stand along with handing them out. I wished at times that I had another job like giving out various foods so I could have had more interaction with the people because they were really the friendliest people I had met in a long time. Everyone thanked me as I handed them cupcakes, and this one lady said “ have a bless weekend” to me. I really enjoyed it and would do it again. As I went to Harlem, I saw very poor areas. I saw how people with needs came lined up for food. I took the position as being a server of tilapia fish. As people came, they would ask for more food, and they would try to take seconds. Some said they had wives waiting for food, and some had injuries and asked for us to help them put food in the “to go” containers. This was a very awesome experience because I got to meet new people and hang with my friends. We would sing and rap and talk about experiences we had that were related to this soup kitchen. Premnauth fills up a “to go” container with tilapia. This cool guy I met named Matt helped us prepare our dishes to serve. One thing I noticed about him was, he was very open and charismatic toward the people who are in need. I liked how he communicated to people with kindness. Over all, this man was able to cook and do as much as he could to help people who needed it. Therefore this soup kitchen taught me a lesson to appreciate what I have. On the 25th of January, I went to a pantry as a member of SkillsUSA. It was a great experience to serve people with respect, and I feel really honored to get to serve. The part I was responsible for was drying trays. These trays was washed in a machine with high pressure warm water. It was really tiring to press my hand against the tray while holding a thin layer of paper towel. After drying the tray, I needed to place knives, spoons, and forks onto the tray. But it was all worth it to serve people in need of food. Dante Meade portions out rice. One of the challenges I faced was my shyness. I was kind of shy to ask for my part in the kitchen but after some encouragement, I finally asked for my part. I was honorably given the job of taking pictures while serving the people who have difficulty in life. Hopefully I can go again because the experience there is really fun. I was also given the task of taking pictures of the members of SkillsUSA. I tried to make every single picture capture the awesomeness of the members and staff in the kitchen. If I’m given another chance to go, I would definitely go.